This is showing up again on Friday as part of project progress, because I've been meaning to do this forever! We have a lot of bags. I have a thing for bags. 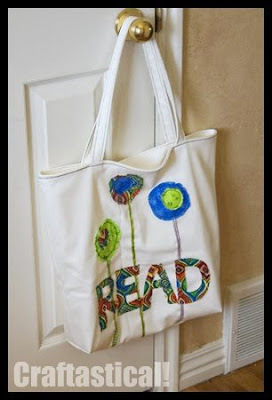 However, most of our bags are either A. ugly B. boring or C. in use. 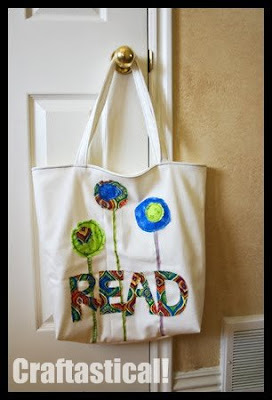 Whenever I go to the library, I wish I had a bigger tote or a tote just for the library. I don't read so much as devour books--my mom used to ground me from books as a child, as that was the most painful thing to loose and no chance of it turning me against reading. I can easily read a book a day if I don't control myself. I hate running out of books, so that means we need a lot of room in a library tote. 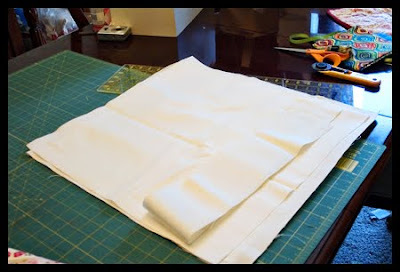 Ok, first off, a list of what you need: --About 1 1/4 yd of fabric for exterior and lining. Can be same or different, but about 1 1/4 yards total. Cut out four panels the same size. I did mine 19.5x19.5". Mark centers on each side to help with alignment later. Cut out two strips of fabric, about 4x25". 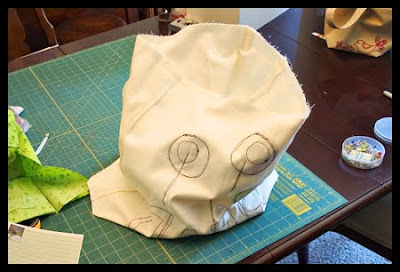 Apply fusible interfacing to back of all pieces if you're using it. Fuse webbing to back of scraps. Iron front exterior in half from top to bottom for next step. 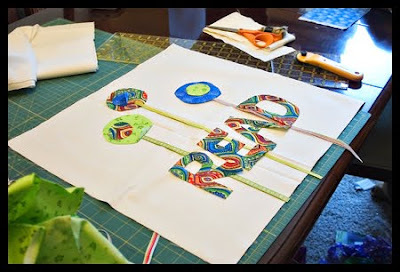 Lay out appliques. Remember to keep about three inches from the sides and same from the bottom. 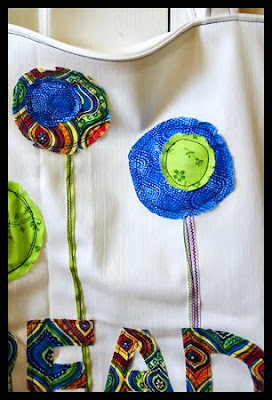 I used ribbon and fabric circles to make flowers on mine, plus letters I cut out by hand. 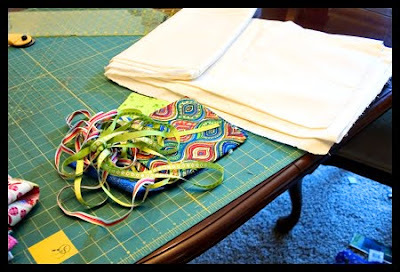 Once you have a design you like, start with the bottom layer and fuse and sew. I sewed about 1/8" inside the appliques so the ends will start to fray. Finish sewing on appliques and trim all the threads. Make handles. 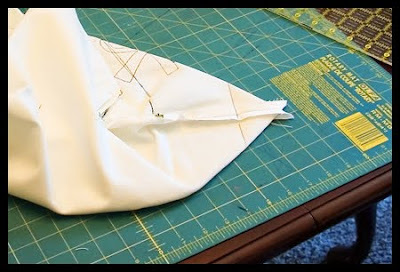 Fold your strip in half and iron, then fold outside edges to meet the center fold. Iron, then fold in half and topstitch about 1/8" from edges. I used black thread for added interest. Put right sides of exterior together and sew around edges as shown, matching centers, with 1/2" seam allowance. 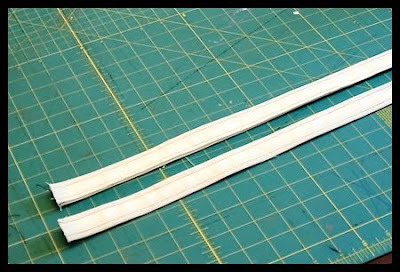 Do the same for lining, except be sure to leave a gap (5-6") in the bottom for turning. Iron seams open. 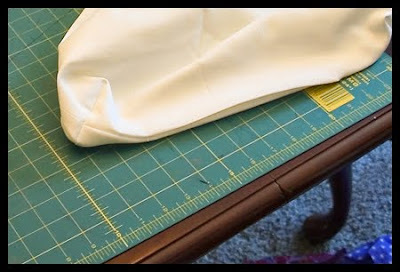 Pull sides so that the side seam and the bottom seam meet. They should form a right angle. Press. 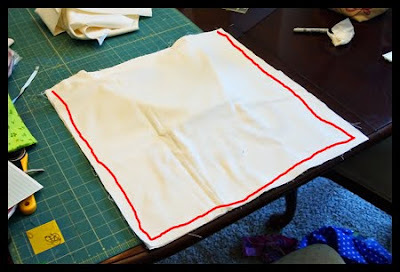 Draw a line at a right angle to the seam 4" long. Mark, then sew. Repeat for each corner, two on exterior and two on the lining. With right sides together, put lining into exterior. Match up seams and centers. Pin. Make sure the handles are out of the way and between the layers. Step 13: Iron gap so that it lies flat. Sew up gap. Last step! 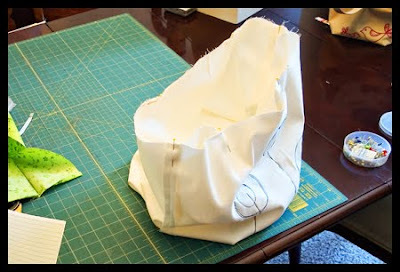 Put lining down into bag and topstitch around top of bag. I'm so pleased with how it turned out. It's the perfect size and I'm not going to be tempted to use it for something other than library books. Wow, this bag is super cute. I LOVE it. You seem to be able to turn your hand to anything, Kara! Amazing job! Brilliant!! I think I'll have to make one of these myself someday. I'm not much of a sewer, but I like your bag much more than the one I'm using right now. Really, really cute bag. I have a thing about bags too. It is a sickness I tell ya! I give this a "Best Small House Idea Award"...We live in a 3 room house and every inch of realestate is taken....Controling our Reading material is Our Hardest Challenge and You Just present "ONE COOL SOLUTION!" How cute! Love the applique! 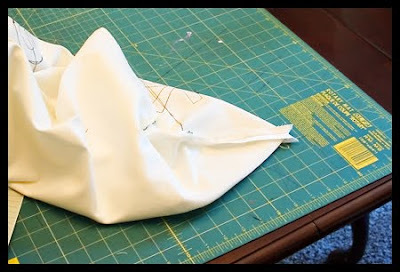 I googled how to make a lined tote and this popped up. I used to get grounded from books, too! LOL! We didn't have a tv so I read everything from cereal boxes to parenting books. I used your tutorial to make myself a market bag. Your instructions were perfect. Thank you so much. Great tutorial! 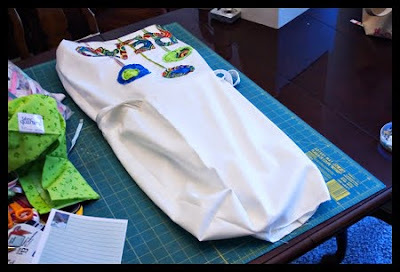 I googled "how to make a tote bag" and found your tutorial. I just used it to make two totes for two little girls whose home burned down. I look forward to looking around your blog. 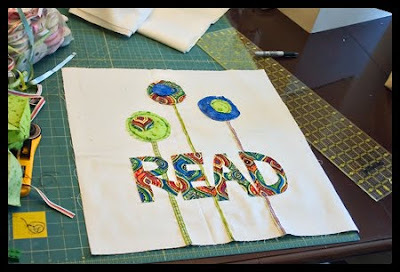 I did end up using this tutorial to make my daughter's library bag, and the tute was AWESOME! Very easy to follow and I turned out a pretty professional looking bag I think. Thanks! 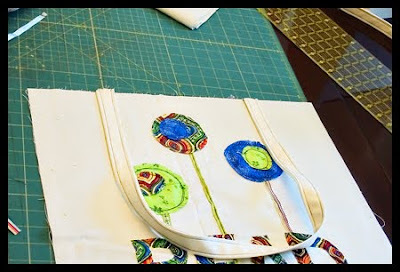 Great tutorial- I love my bag! I just posted a link back to you on my blog! I love the bag. 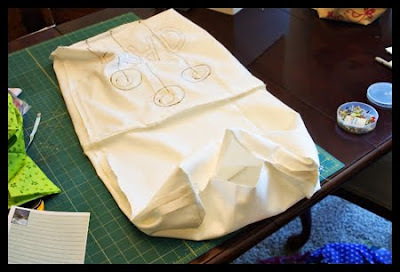 I read and re-read the part where you attach the lining to the tote and, for the life of me, I could NOT understand how to do it. I was confused about turning the bag and/or the lining inside out first before putting them together. I also couldn't figure out how to turn them after being sewn together so that the lining was on the inside of the tote and the lining's seam allowances didn't show when you looked inside the tote UNTIL I realized I had to leave an opening at the bottom of the lining so that I could turn the bag and lining the way it is supposed to be turned in order to finish the bag. I FINALLY figured it out, thanks to your instructions. I guess at the tender age of 62, I am just becoming mentally DENSE. Thank you. Now I can finish my totes with the absence of cuss words as I sew. Hahaha. Made 2 of these bags .... love how they go together! This was my first ever 'proper' sewing project; but I made it smaller for a friends little girl's forthcoming birthday. I'm going to put a little book inside - thought she might use it for nursery in the future. Anyway - it's taken me all night but I am so thrilled with the results; sure, there are a few wonky stitch lines and I had to read, re-read and read again to make sure I understood the terminology (baste!!!! - I'm in the UK - that means cover a chicken with fat!!!) but got there. You are officially on my favourites list! !